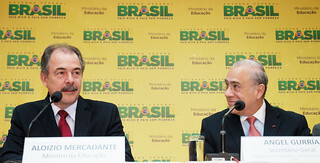 21/10/2013-OECD Secretary-General Angel Gurría today welcomed Brazil’s further engagement with the Organisation’s world-leading global education assessment programme (PISA) during a signing ceremony in Brasilia with Brazil’s Minister for Education Aloízio Mercadante. Brazil committed to becoming an Associate in the Governing Board of the OECD's Programme for International Student Assessment (PISA) from 1st January 2014. The OECD’s PISA programme aims to help countries assess how their school systems match up globally in terms of quality, equity and efficiency standards. Brazil took part in the first round of tests in 2000, and has seen strong improvements in its results since then. Every three years, about half a million secondary-school students from around 70 countries and economies, accounting for almost nine-tenths of the world economy, take part in the PISA assessment. As an Associate, Brazil will take part in the meetings and work of the Governing Board which determines the policy priorities for PISA and makes sure these are respected during the implementation of each PISA survey. Brazil currently attends meetings of the Governing Board along with other countries and economies as Participants. Although Associates are economies that are not OECD members, they have membership rights and obligations in regard to specific OECD bodies and programmes. Brazil has taken part in the latest OECD PISA Assessment which focuses mostly on mathematics. The initial results will be released on Tuesday 3 December 2013.